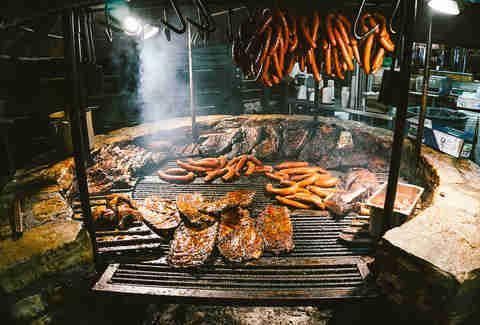 Aside from Willie Nelson and Beyoncé, barbecue might be Texas’ most famous export. The tradition of smoking meat “low and slow,” then devouring it by the pound, is linked to the state’s identity like New York City and pizza or Portland and bearded baristas. Indeed, Austin has so many fantastic barbecue options, you could throw a dart at Google Maps and have the best brisket of your life (but then you’d have a shattered iPhone screen). And even the most reliable of recommendations won’t prepare a visitor for what will likely be one of the best meals of your life. So we’ve put together a guide to ensure that you know where to go, what to order, and how to eat it. Spoiler alert: leave the barbecue sauce on the side. Quick primer on barbecue regions -- Texas eats beef, everywhere else cooks pork. 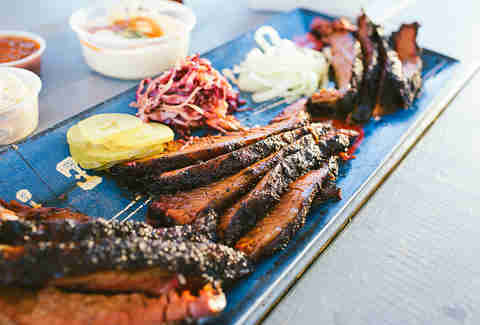 The main course of every barbecue meal in Austin, or elsewhere in the state, is brisket. In other parts of the country, the unwieldy cut of meat from the breast of the cow is most commonly cooked as a pot roast, but in Texas, it is traditionally rubbed with salt and pepper and smoked over post oak wood for anywhere from eight to 20 hours. It’s a tough cut of meat to cook because one area (the point) is distinctly fattier than the other (the flat). As such, most restaurants offer a choice between moist (or fatty) and lean. If you’re looking for that melt-in-your-mouth texture, go moist. Choose lean for less of a fat bomb (but be warned, this ain’t no diet option). Anything good is worth waiting for and we can all agree that Texas barbecue is very good. Hate to break it to you, but you’re not the only one who had the idea to eat pounds of beef on this sunny afternoon. Most of the premier places in town command serious lines. Famed Franklin Barbecue is the only true day-long commitment (people begin lining up at sunrise), but you can expect to wait at least an hour at most of the best trailers, so plan accordingly. Thankfully, many trailers with longer lines hand out free beer while you wait (or suggest you BYO). It isn’t verboten for groups to have a designated lineman, but it is highly frowned upon to hire a stranger to be one. 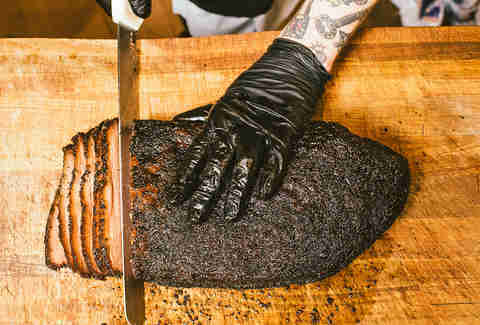 Aaron Franklin makes the best brisket in the world; you’ll find few who disagree. There are only so many times in life when you actually get to try the very best of ANYTHING, let alone such a magnificent delicacy as brisket. Considering the prices at Franklin are roughly the same as most other barbecue places, it’s almost a responsibility to give it a shot… if you can. Admittedly, not everyone has the luxury to get in line at dawn for a spot that opens at 11am. Wait times at Franklin change day to day, but on a weekend, don’t bother arriving later than 8am -- and even that’s pushing it. If you do have the time, however, it’s an experience that’s rarely regretted. The line atmosphere is akin to a tailgate; you can bring a lawn chair and make small talk with your neighbors in patience. That said, if Franklin’s barbecue is a 100 (emoji! ), a place like Micklethwait Craft Meats or La Barbecue might score a 99. Is that extra one point of quality worth your time? That’s a personal question. We’ve already established that brisket is king, but the rest of the royal family is comprised of sausage and pork ribs. Sausage-making dates back to Czech and German immigrants, but these days you’ll find a wide variety of internationally-flavored options. Most places offer a traditional “hot guts” beef sausage and a jalapeno cheddar, but there are also innovators using casing proteins like duck or making regional varieties like pork andouille or, in the case of Kerlin BBQ, stuffing links into unlikely breakfast pastries to create its now-legendary kolaches, which spawned a trailer of their own. 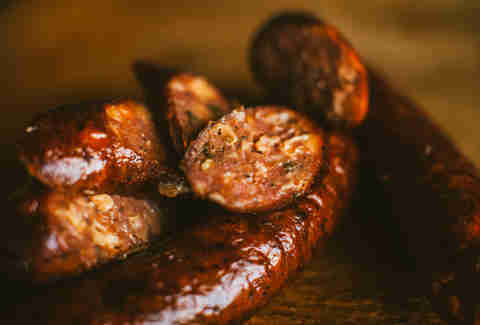 Micklethwait is also known for its specialty sausages and offers a selection that changes daily. 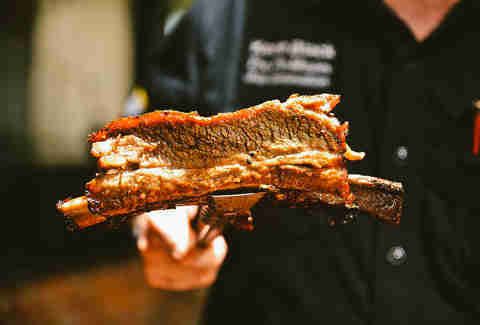 The style and cut of pork ribs varies; some serve baby backs, others spares. Expect the ribs to lack the sticky, sweet sauce you’ll find in other barbecue meccas, like Memphis -- most Texas ribs are dry-rubbed, with a light glaze of sauce, if any at all. 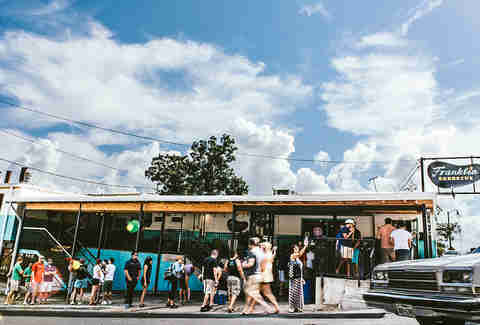 Brown’s Bar-B-Que, a humble trailer parked outside Corner Bar on South Lamar Boulevard, smokes some of the city’s best alongside Freedmen’s, who gives their ribs a gourmet touch in the form of a jalapeno jelly glaze, and La Barbecue, whose third-generation-pitmaster pedigree means consistency is prized above all else. Cows are big animals, and holding all that delicious beef inside them requires a massive ribcage. 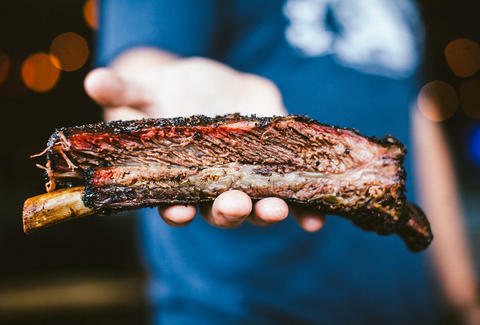 Beef ribs are a relatively new entry into the canon of Texas barbecue (Black’s in Lockhart claims to have originated the trend in the early ’90s), but their insane marbling, candy-like fat content, and Instagrammable size has made them a quick favorite. The trouble with a beef rib is that it usually weighs several pounds and since it’s naturally served on the bone, there’s no such thing as a half order. That means you’ll likely be paying $20-plus dollars for a rib that is rich and filling enough to give even the most brave Texans the meat sweats. They’re truly a delicacy, but be prepared to have leftovers. Texas barbecue reveres tradition, with cooking techniques and lore passed down from generation to generation. But its recent boom in popularity has led to cooks making the cuisine their own. One of the best is Valentina’s Tex Mex BBQ, which smokes a mean Texas brisket, but also makes its own tortillas and simmers some of the best carnitas in town. Kemuri Tatsu-ya and the just-opened Loro (from THAT Aaron Franklin and Uchi chef Tyson Cole) both combine Texas techniques with Asian flavors to great acclaim, with dishes like brisket ramen and char siu pork shoulder. And LeRoy and Lewis breaks all the rules, eschewing brisket altogether for cuts like beef cheeks and creative sides like kimchi. Most pitmasters scoff at the idea of “rules” for eating Texas barbecue, but one definite faux pas is to drown your meat in a pool of sauce. There’s nothing intrinsically wrong with barbecue sauce, and pitmasters take pride in creating a tomatoey compliment to their meat, but dousing a slice of brisket in it masks those 20 hours’ worth of smoky flavors. Do your taste buds a favor and just make a little puddle on the side for dipping. Meat is obviously the main course, but there's plenty to love about a Texas barbecue experience beyond just proteins. Beans in a soupy brown sauce studded with chunks of brisket can be found just about anywhere, as can some variation of slaw, and you can always expect a loaf of plain white bread alongside a tray of onions and pickles. Beyond those standbys, there's a wealth of cravable sides that you simply can't miss, like Micklethwait's cheesy jalapeno grits, a variety of kimchi dishes at LeRoy and Lewis, smoked street corn at Valentina's, and chipotle slaw from La Barbecue. Austin may have the highest concentration of excellent barbecue in the world, but there are some experiences you can’t get without leaving city limits. Within an hour of the city there’s a wealth of old-school institutions with atmosphere that could never be reproduced elsewhere (we’re looking at you, Brooklyn). Louie Mueller Barbecue in Taylor is perhaps the most legendary (it’s now on its third generation of pitmaster), Lockhart has three fantastic old-school options -- Black’s, Kreuz, and Smitty’s -- and every Austinite has a soft spot for the bucolic country roads leading to the original Salt Lick in Driftwood, with its rolling pastures and a so-beautiful-it’s-cliche babbling brook. While you’ll definitely want a nap after your meal, the Texas barbecue experience doesn’t have to end there. Most restaurants will have something you can take home, be it a T-shirt or hat, a signature sauce, or even a cookbook. Plus, many even offer mail-order services that will deliver precooked meats to your doorstep, so when you can’t make it to Austin, Austin can come to you.